Read here about membranes that are deployed as continuous tension components of tensegrity structures. For general discussion of fabric, see Fabric. A classic tensegrity structure articulates compression and tension via separate, visually discrete struts and tendons. However, no rule states that the tendons must be distinct. A continuous fabric envelope, holding all the struts apart in mutual tensile separation, would fulfill the tension task as well. This type of fabric deployment is called using a "membrane." The strictest definitions of tensegrity seek the minimum use of materials. A strut and tendon structure would feature only one unique tendon for each vector of tension stress. A membrane, on the other hand, features hundreds of not thousands of tendons woven together in a fabric. Most of these are not completely tensed along any given vector, thus it can be argued that minimum material usage has not been achieved. However, this lack of minimum material deployment may be compensated by the simplicity of the membrane deployment: a universal, enveloping membrane may require less planning and calculation to hold a given set of tendons in islanded compression. 6 strut antiprism, right side with tendons, left side with membrane. 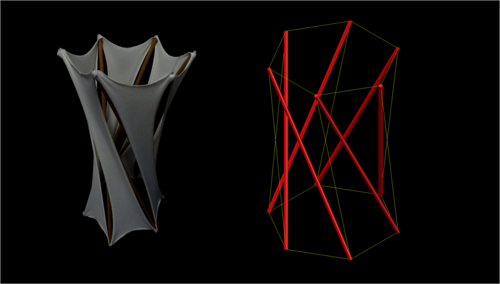 Source: SMiA" http://smia-experimental.com/2014/10/15/w-shop-2014-tensegrity/"
Mizuki Shigematsu, Masato Tanaka, Hirohisa Noguchi published articles regarding these types of structures, calling them “tensegrity membrane structures. They couple tensegrity with membrane via tension loads and can be one of the rational structures achieving maximum space with minimum use of materials." Shigematsu defined tensegrity membrane structures that couple tensegrity with a tensioned membrane structure. By using the present analysis method, the self-equilibrium form of tensegrity membrane structure could be found and the basic configurations of Diamond and Zigzag models were demonstrated. The application to a structure such as a "practical tent warehouse" was illustrated to show the possibilities of tensegrity membrane structure. 4 strut antiprism membrane tensegrity by Shigematsu"
24 strut membrane tensegrity by Shigematsu." 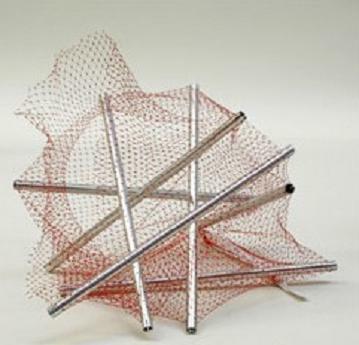 This image, published on the web, shows seven struts in a similar net bag. 7 bars in a mesh bag"
In 2011, the MOOM pavillion was erected, it uses a membrane tensegrity stucture. For more details, see MOOM Pavillion. 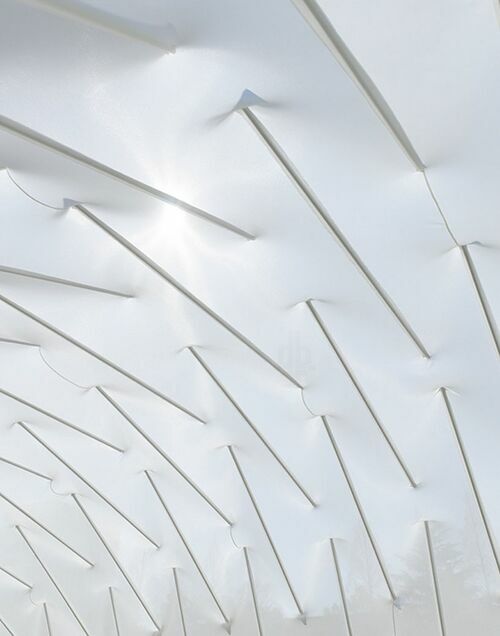 The MOOM Pavillion membrane contains 131 embedded struts. Photo by S. Hotta." link= "MOOM Pavillion"
This page was last edited on 28 January 2019, at 11:16.